I have decided the world of vintage is more like a Universe of Vintage with untold galaxies of things people love. There is so much to be curious about Out There, I feel like an explorer of the cosmos every time I pick something up and wonder about why and how it came to be. 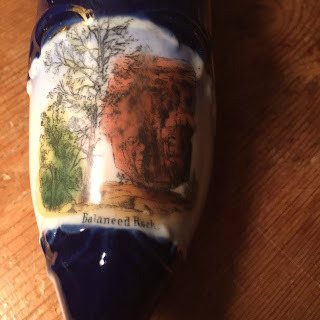 I am always to drawn to strange juxtapositions in old things, like a porcelain shoe with a picture of Balanced Rock printed on it or a tiny fragile tea cup that has a scene of Niagara falls on it—and ladies carrying parasols. Why porcelain? Who collected these things and when?